Ananda’s Wednesday begins with Billie Holiday. Listen to my audio blog below. It talks about how I started my day with the music of Billie Holiday. Since it is Black Music Month, I gotta ask, who are you listening to? Ananda with Corey Ealons, Director of African American Media and Coordinator of Special Projects, originally uploaded by anandaleeke. Guess where I was on Friday afternoon? The White House. 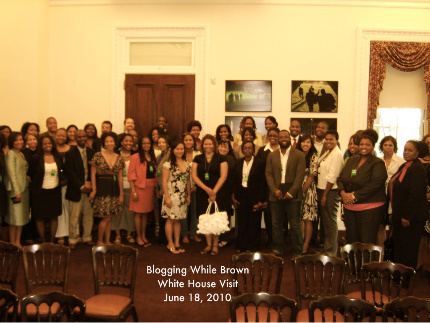 I visited the White House with my fellow Blogging While Brown 2010 Conference (BWB – www.bloggingwhilebrown.com) attendees for a meeting with Corey Ealons, Director of African American Media and Coordinator of Special Projects. Click here to see additional photos from my White House visit: http://www.flickr.com/photos/anandaleeke/sets/72157624182104723. 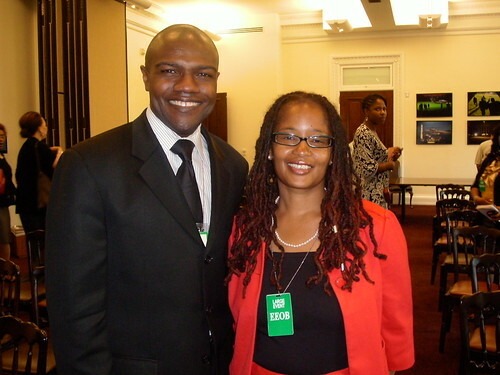 During the 2008 General Election, Ealons served as director of African American Media for President Barack Obama. Melody Barnes, Director of Domestic Policy Council, and Jessie Lee, Online Programs Director, also met with us. This meeting set the tone for my BWB experience. It inspired and changed me. It also motivated me to step up my blogging and online activism! Look for news about my WhiteHouse.gov Wednesdays project in the coming days. Click here to read my Examiner.com article about the meeting. The Washington Post also covered the meeting. Woo Hoo BWB! Many thanks to Gina McCauley and the BWB team for a fabulous conference! It was the best BWB so far (loved 2008 and 2009 conferences too!). Here’s a special treat! Watch an episode of Ananda Leeke TV featuring Corey Ealons speaking at Day #2 of BWB. He is an amazing person! Ananda @ MLK Jr Memorial Library book reading in the Washingtonia Division on 6.12.10 in DC, originally uploaded by anandaleeke. 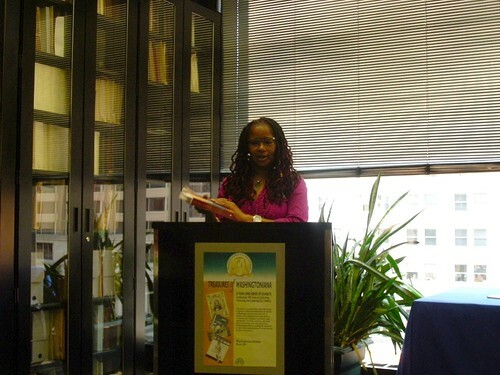 My June 12th book reading at Martin Luther King, Jr. Memorial Library in DC was a lot of fun. I discussed my new book That Which Awakens Me: A Creative Woman’s Poetic Memoir of Self-Discovery (November 2009 – Amazon.com) and debut novel Love’s Troubadours – Karma: Book One (August 2007 – Amazon.com). The audience was fantastic. They had some great comments and questions! Click here to see my Flickr photos from the book reading: http://www.flickr.com/photos/anandaleeke/sets/72157624260508400. My stylist Sharon Malachi a/k/a Butterfly LP recorded a video of me after the event. It gives highlights from my Summer in the City weekend adventures. See below. Many thanks to the Washingtonia Division staff of Martin Luther King, Jr. Memorial Library staff for helping me organize a great event! PS: I made an infomercial about my Summer in the City events the night before my book reading and posted it on YouTube, Facebook, and Twitter. Check it out. Hope you will join me at some of the events. My next book reading is July 10 from 2:00 pm to 3:00 pm at Flow Yoga Center (click on the link to register for the event at Flow) in DC. Click here to learn more: http://anandaleekejulybookreading.eventbrite.com. 039, originally uploaded by anandaleeke. Last night I spoke at Ignite DC #4. “Who lives inside of me?” was the title of my five-minute talk. Visit www.ignite-dc.com to learn more about this amazing event. Click here to read a summary of my talk: http://www.ignite-dc.com/speakers/369. 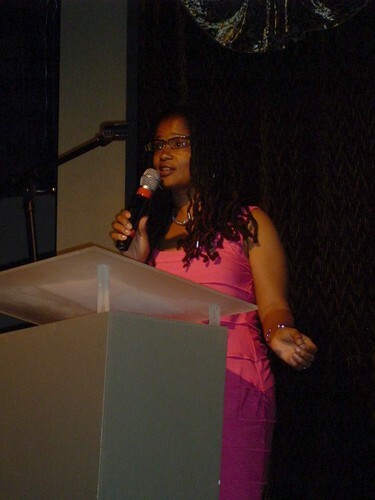 My talk was based on my eight archetypes discussed in my new book That Which Awakens Me: A Creative Woman’s Poetic Memoir of Self-Discovery (November 2009, Amazon.com). Six-word memoirs, yoga, poetry, and my creative process were mentioned during my talk. My dad “J” videotaped my talk. See the video below. The Ignite DC organizers will post the 16 speakers’ talks on Blip.tv in a few weeks. I’ll be sure to post the link when it goes live. Ignite DC #4 was a great event. I saw so many friends and met many new people. I also took a lot of photos. Click here to see my Flickr photo set: http://www.flickr.com/photos/anandaleeke/sets/72157624167809241. Many thanks to the Ignite DC organizers, sponsors, attendees, and speakers (amazing group of folks — I learned so much from them and laughed too!!!). A big thanks to everyone on Twitter and Facebook who mentioned my talk, took photos, and shared my links. PS: Blogging While Brown is my next social media event! Visit www.bloggingwhilebrown.com or http://twitter.com/bwbconference. Blogging While Brown begins on June 18 at the Washington Convention Center in DC. I will teach a yoga class for social media users from 8:15 am to 8:30 am on June 19. I am so excited about attending the conference. It will be my third Blogging While Brown conference! I am also excited about going to the Blogalicious/Red Pump Project meet up at Tabaq on June 19. So get ready for lots more videos, photos, and Facebook/Twitter posts!!!! In late May, I launched the Women in Social Media series on Sisterhood the Blog Radio with Lynne D. Johnson, Senior Vice President of Social Media for the Advertising Research Foundation. I have admired Lynne for many years (loved her blog when she was at Fast Company, one of the first tech magazines I started reading in the late 90s) and read her blog like it is a religion! She is truly one of my digital diva sheroes! Check out Lynne’s interview with another one of my fav social media sheroes Lena West. On June 1, I spoke with Sonya Steele, a lawyer turned LA-based screenwriter, about her new web TV show “Celeste Bright.” See video trailer below. It is INCROYABLE (incredible as the French say!). It launches later this month. 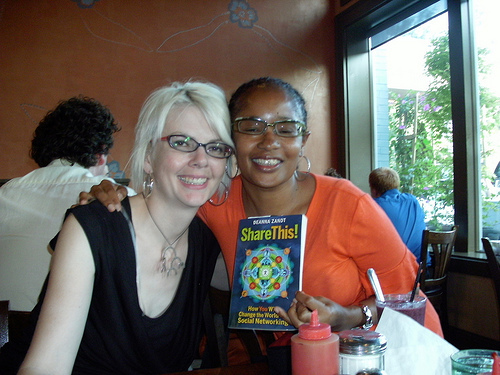 I spoke with my new favorite social media author Deanna Zandt, a media technologist, about her new book Share This! How You Will Change the World with Social Networking on June 6. Deanna and I had a chance to meet in person at Open City on June 7 while she was in DC for a book reading and conference. She is amazing. See our photo below. I will be writing a book review about Share This! later this month on my DC Social Media Examiner column. Be sure to tune into the Women in Social Media interview series on June 10 at 8 pm EST (Pam Perry), June 14 at 9 pm EST (Johanna Vondeling), June 15 at 8:30 pm EST (Katherine Lewis), June 17 at 8 pm EST (Kety Esquivel), and June 22 at 8 pm EST (Shonali Burke). These are powerful ladies with passion and positive energy!!!! They rock! NOTE: I am using my Sisterhood the Blog Radio and BAP Living Radio interviews as research for my next book Sisterhood the Blog: Soundbytes from the 21st Century Women’s Online Revolution (December 2011). Here are some of my promotion tips for authors who are planning book talks and signings. If you have tips, please share them. Thank you in advance! 1) If you use Facebook and LinkedIn, create an event for your book talk and signing. Post it on your personal profile, book page, and/or Fan page. Also post it on any group pages that serve as your audience. Make sure you invite all of your friends to the event. Ask them to share the event on their pages. They can be your ambassadors of goodwill and PR! For LinkedIn Users: Once you post your event, you can share it with members of groups you belong to. That helps to promote your event to a wider audience. 2) Create and send an Eventbrite invitation to your email list on Yahoo, Gmail, or AOL. I used Eventbrite a few days ago and plan to use it again for my July and September events. Here is my invite: http://anandaleekebookreading.eventbrite.com. 3) Hold a Twitter chat (haven’t done this one yet, but have watched some friends do it) or UStream.tv live chat before the event (have used this before; it gives folks a chance to see you and ask questions). 4) Talk about your event on Twitter and get a group of your followers to retweet your event notices. Let your peeps help you. They love it. It feels good to be able to ask for help and then show appreciation. 5) Post your event on your blog and social networking sites where you have blogs. Ask folks to spread the word. 6) Ask your fellow bloggers to post notices about your event and book on their sites. You may need to swap some guest posts or event promotions, but it is worth it. Sometimes folks post your events without a request. That’s a true blessing too. It happened to me recently when the Hell in a Hand Bag blog posted about my event. Many thanks to blogger extraordinaire Original Najeema for the post and tweets on Twitter. 7) Consider doing audio blogs with excerpts from your book and posting them on your web site, blog, and social networking sites. You can use www.cinchcast.com or www.utterli.com. I use Cinchcast a lot these days. Check my page out: www.cinchcast.com/anandaleeke. 8) Create a short video commercial about your book events and post it on YouTube (used for my book release in November 2009 – did a 7 day countdown in December 2009), Vimeo, or Blip.tv. You can use your computer’s web cam, cell phone camera, digital camera, or a flip camera. Share a summary about the book and read an excerpt. Post the video on your web site, blog, and social media sites. Ask your friends to share it with their friends as posts on Twitter, Facebook, and other sites. 9) Connect your book and event to a national observance or local event. I tie a lot of my book events to national observances. For example, I am having a book reading during June which is Black Music Month. 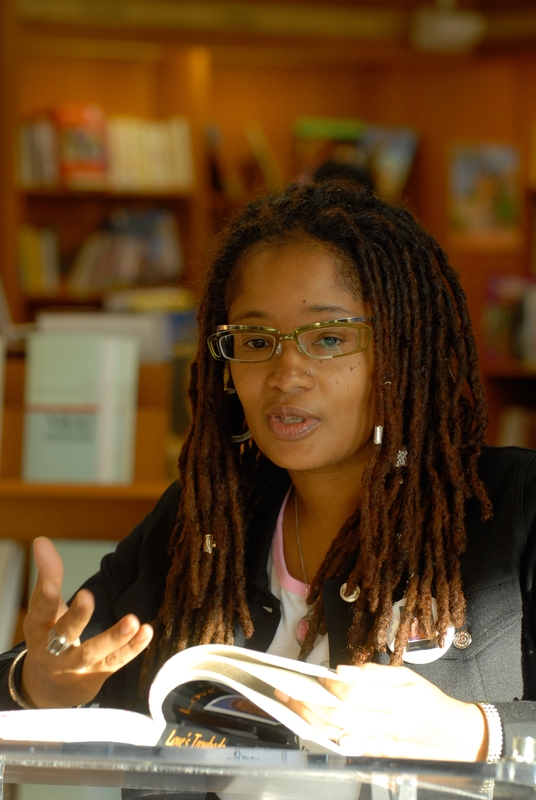 My novel Love’s Troubadours and memoir That Which Awakens Me discuss Black music. So I have been tweeting about the music in both books this week. I also mention my book web sites and book reading dates. In addition, my book reading is happening during DC Digital Week. So I am hosting a free yoga class to support the Week. During my class I will read a short excerpt from my memoir because it is yoga-inspired. I will also share that my novel is yoga-inspired too. I am teaching the yoga class in a park that I discuss in my book. So I will mention that too. My memoir includes insights about my social media journey. So that will be included too. 10) Share what you learn from the book promotion process with others. It helps you establish social capital and participate in the gift economy author Tara Hunt discusses in her book The Whuffie Factor (one of my favorite books). When we give and share, we will be blessed. That’s the universal law of give and take! What are your June adventures? Learn about Ananda’s June adventures on Sisterhood the Blog Radio, Ignite DC #4, Blogging While Brown, and DC She Writes Meet Up. What kind of June adventures do you have planned? My June adventures are fun-filled. Check them out below. Hope you can join me! 1) Ananda is hosting the Women in Social Media series on Sisterhood the Blog Radio on June 10 at 8 pm EST (Pam Perry), June 15 at 8:30 pm EST (Katherine Lewis), and June 22 at 8 pm EST (Shonali Burke). 2) Come here Ananda’s June 16th talk on “Who’s living inside of me?” from 6pm to 10pm at Ignite DC, Town Danceboutique, 2009 8th Street, NW, Washington, DC. 3) Watch Ananda’s kg yoga life practices class on Mom TV on June 16 at 8:00 pm EST (the show will be pre-recorded in the morning). Click on the link to watch the show: http://www.momtv.com/kgyogalife.html. 4) Register for the Blogging While Brown conference in DC (click here to register) and take Ananda’s yoga class for social media users on June 19 from 8:15 am to 8:30 am at the Walter E. Washington Convention Center, 801 Mount Vernon Place Northwest, Washington, DC (located at Mt Vernon/Convention Center subway station). 5) Ananda is serving as the organizer for the DC She Writes Meet Up on June 29 from 6:30 pm to 8:30 pm at Teaism, 400 8th Street, NW, Washington, DC. Click on the link for more details: http://www.shewrites.com/events/washington-dc-sw-first. She Writes – www.shewrites.com – is a social networking site for women writers. It was established on June 29, 2009. The Meet Up will celebrate the first year anniversary. I know I have been missing in action on this blog for awhile. Where have I been? Twitter and my Facebook Fan page have captured my attention a lot. I have also been posting audio blogs on my Cinchcast page. I will do a better job of posting blog entries this month! This week I am gearing up for DC Digital Capital Week. It begins on June 11. I am teaching a yoga class for computer users on June 12th at 10:00 am. It will be held in Malcolm X Park in DC. Click on the link for more details: http://yoga.meetup.com/584. Join me for my June 12th book reading which will be held from 2:00 pm to 3:00 pm at Martin Luther King, Jr. Library, Washingtonia Division, 901 G Street, NW, Room 307 (Washingtoniana Division’s Program Room), Washington, DC (located at Metro Center Station and near Gallery Place Metro Station). I will talk about and sign my new book That Which Awakens Me: A Creative Woman’s Poetic Memoir of Self-Discovery (2009 – http://amzn.to/7zGkGI) and debut novel Love’s Troubadours: Karma – Book One (www.lovestroubadours.com – 2007 – http://amzn.to/bWKCvw). FYI – My books are also available on Amazon.com (http://amzn.to/d4RwQN). I will be giving another book talk and signing on July 10 from 2:00 pm to 3:00 pm at Flow Yoga Center (www.flowyogacenter.com), 1450 P Street, NW (located several blocks from Dupont Circle Metro). Hope to see you on June 12th and/or July 10!